It's no secret about my love of tribute bands. Sure, you can watch videos of the "classic" rock 'n roll bands in concert, but nothing compares to a top notch tribute band live. Especially one that pulls of the "illusion" successfully, making you feel just for that evening that you were at the actual concert. I've seen about a dozen Beatles tribute bands and a couple of Kiss ones. In fact, the year that Kiss went on it's overpriced "farewell" tour, I opted instead on seeing a Kiss tribute band and I wasn't disappointed. There is nothing more depressing than overweight rock stars trying to recapture their glory years. 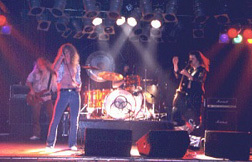 Most tribute bands strive to present the band at their "hungry" height. Led Zeppelin was one of the fave bands of my youth (behind of course the Beatles). So, when the Led Zeppelin tribute band ZOSO came to town, I was THERE! ZOSO consented to an interview before the show, where we talked about how they became a Led Zeppelin tribute band. While I anticipated some of their answers, I was surprised at some of the others. E.C. : The first and most obvious question is - what brought you together as a Led Zeppelin tribute band? ZOSO: Accident (laughs). We were already a band, the bass player, the drummer and myself. Somebody recommended to us out in California that we should try it out. E.C. : Did you record anything before? ZOSO: Actually, none of us did. E.C. : Do you think that the rise in the number of tribute band, be it the Beatles, Stones, Kiss, Zep and the Doors is a sign that something is "missing" from today's music? ZOSO: YES! It's too corporate. Creativity is gone. ZOSO: Yes, it's still around thirty years later. We've found that there's a major young audience. My impression is, why they like this music better than their own. It just doesn't make sense. The record company's still think they can pioneer something. E.C. : Not just any band can get up there and do a convincing Led Zeppelin tribute. What makes your band stand out from the other tribute bands? ZOSO: We are the only one that tours. Allot of tribute bands that will stay in their hometown or in a tri-state area, but they don't go past that. The whole combination of talent and musicianship...and that's what it needs. And we get those responses from people. They are the true judges. E.C. : You have toured all over the U.S., have you ever toured overseas? E.C. : What kind of work goes into making a Zep tribute band? Obviously, you learn the music from the records. Other than "The Song Remains the Same" movie, what do you study? ZOSO: That's the only thing that we really had [The Song Remains the Same], I mean we might find a bootleg video. It's a shame that we don't have as much footage on them as say the Rolling Stones or the Beatles. E.C. : You must get a rush from being on stage to a captive audience playing popular Zep tunes. I mean, it is every high school kid's air-guitar dream! Is it a bigger rush than playing your own music? ZOSO: Sure, it would be fantastic to get that same kind of response for doing our own stuff. I think that was the first thing that I personally thought about when it was recommended to us that we should try this out...the critiquing by the audience and I for one didn't want to be part of their slaughter. That is an advantage is that we are more of a specialty act and we don't have to do what everybody likes, we can actually play within the context of Zeppelin. There are other Led Zeppelin bands that won't play the songs that we play. E.C. : What would you say to critics of your band? I'm sure you hear, "they're not even playing their own music!" ZOSO: They keep their jobs off trying to convince people that they know more than everybody else. Even Wayne Newton...even Englebert Humperdink...even Linda Ronstadt doesn't write here own songs. We can just go down the list. But it's not easy getting up there and doing what we do - not just anybody can do it. I would say that we probably get it more from musicians than anybody else. I think more musicians are more envious of the fact. You gotta be "on". E.C. : Have you had any constructive criticisms that you've used to enhance your performances, i.e. good ideas from others? ZOSO: We just worked that out between the four of us. We never really let any outside influences come into the band. We are harder on ourselves than anybody else. E.C. : Obviously, you can't put out records. But, you have an opportunity to appear in films like some of the Beatles and Kiss tribute bands have. Has this happened to your band? E.C. : The people who see your show obviously wouldn't want you to stray from the original versions. However, Page & Plant did the unplugged album - so are you ever tempted to change the arrangements? ZOSO: We do extended jam sessions of songs, like "Dazed & Confused" & "No Quarter", which a lot of Zeppelin bands don't do, its virtually unheard of. Nobody really does it, but we do. We kind of took a chance in doing that and it works out. E.C. : Were there any legal issues doing a tribute band? It helps them sell albums! I'd like to check soundscan after every city we play. Just to see how much was selling before we got there and then see how many were selling after. E.C. : Finally, how long do you see yourself doing this? ZOSO: There is a demand and we are booked up better than ever. I was in pure nirvana for the 2 hours that ZOSO performed. With little or no talk between songs, I was treated to an onslaught of classic Zep tunes that transported me back to the glory days of Led Zeppelin live. "Robert Plant" had all the moves and posing's of the real Plant to an uncanny degree, in addition to having the voice! My only complaint of the whole evening is that I wished the vocals were louder, sometime I had trouble hearing them. Hell, I wished the whole band had cranked up the volume a few notches, since Zep was know as a LOUD band (although not as loud as the Who circa mid-'70s). The rest of the band pulled off the illusion as well. "Bonzo" played like John Bonham incarnate, "John Paul Jones" was simply amazing, especially on "The Immigrant Song". And "Jimmy"? Well, "Jimmy Page" was mesmerizing. ZOSO is the only Led Zeppelin tribute band I've seen so far. But, I was impressed enough to agree with the claim on their website as to ZOSO "being the best Led Zeppelin tribute band around." Definitely recomended for ALL Zep fans.